The term Renaissance man could and should be applied to Maurice Tani. A certified jack of all trades in the San Francisco music scene for over forty years, Tani has extensive experience in the recording industry as singer, songwriter, guitarist, bassist, and producer. Recent alt-country/roots music releases with his band 77 El Deora, have garnered him a local following for both his records and live performances. Tani is right at home where the blues relaxes into Americana, and can sing jazz better than most who claim they do. For The Lovers Card, Tani turned to Jim Pugh at the Little Village Foundaton, who called Kid Anderson from Greaseland Studios, in San Jose, to set up the sessions. Tani came well prepared with ten original songs left open to interpretation and improvisation, recorded over a few days in a live setting, capturing a master storyteller at the crest of his craft. His laid back delivery of the linear narrative is ideal for the vivid imagery in his lyrics, reflections on the dark side of romance, and the ensuing emotional unraveling. The styles and directions of the record cover a broad palette, opening with the blues based “Something To Hide,” featuring the wailing harmonica of Aki Kumar. A dramatic mood swing comes with the film noir soundtrack “It Finally Fell For You,” encased in the chanson shaded violin of John McFee, a tale of blind ambition gone awry. Viewed from the jilted side of the room, “It Looks Like You Had It All,” is set to a blue soul tempo with killer organ by Jim Pugh. Pugh moves over to piano on the title track, a romantic rendezvous performed with a touch of tango and jazz. Initially composed for a woman singer, after much thought Tani decided it was time for his own interpretation, certainly rising to the occasion. Life begins anew with a “New Dress,” the leading lady slipping into a fresh disguise, leaving sentimental debris behind. For an interesting take on western tinged jazz, “Take Me With You,” is the personal account of an infatuated neighbor playing the fool, hoping against time and reason. Tani changes into his familiar country persona for the truck-stop love song “Falling,” as the tears drip into the beer. This is a style he is quite comfortable in, allowing him to tell the story his way. Tani collaborated with vocalist Aireene Espiritu on her record Back Where I Belong (Little Village Foundation 2016) and her inclusion on “Three Small Words,” is nothing short of genius. Tani and Espiritu know each other well, and the vocal chemistry is evident, Espiritu adding a strong dose of soulfulness to the song. If there is such a thing as alt-country blues, “Push Me Away,” would fit into that description, an easy going drive up the coast on a lazy afternoon. Starting with a solitary vocal, Tani relies on his jazz, samba, and Latin influences to convey “Out With The Old,” addressing the process of reinvention and renewal. 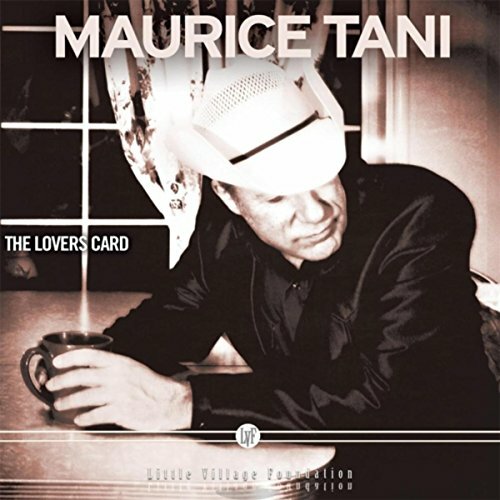 Maurice Tani is a self-confessed urban dweller, who sticks to what he knows, bringing the cosmopolitan feel of San Francisco, and all it entails, into his music. His voice possesses a confidence suited for enjoyable listening, his songs are melodic glimpses into a world of make believe that is painfully true. A natural writer with a musical soul. Personnel: Maurice Tani: vocal, guitar; Jim Pugh: piano, organ; Kid Anderson: lead guitar, organ (4); Mike Anderson: bass; D’mar: drums; June Core: drums (4, 5, 7, 8); John McFee: violin (2); pedal steel (7); Aireene Espiritu: vocal (8); Aki Kumar: harmonica (1); Kathy Kennedy: backing vocal (2); Lisa Leuschner Anderson: backing vocals (7).